These multi-fold ramps are for all scooter and wheelchair types, designed to bridge the gap over steps, curbs, and raised landings. 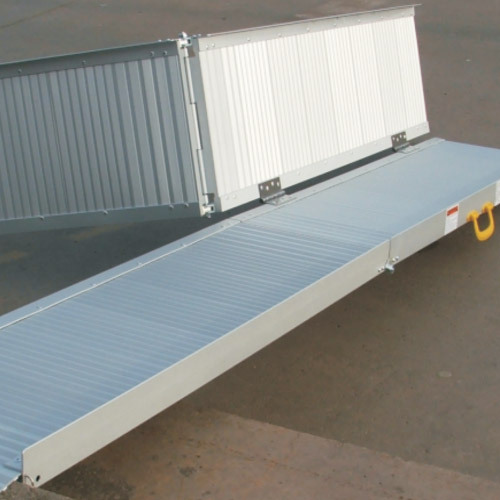 Simply unfold the hinged ramp and position for maximum safety and support. Folds in half to be carried like a suitcase. Made of aluminum and features a durable, non-skid driving surface. Please choose the model that suits your required need. Unfold Size: 5' x 29"
Folded Size: 30" x 16" x 9"
Unfold Size: 6' x 29"
Folded Size: 36" x 16" x 9"
Unfold Size: 7' x 29"
Folded Size: 42" x 16" x 9"
Unfold Size: 8' x 29"
Folded Size: 46" x 16" x 9"